Munchkin Munchies: "One Smart Cookie" CAKE! Last year I made some "One Smart Cookie" sugar cookies to celebrate my son officially becoming a CPA. :) There are many versions of this cookie theme (all are cute! 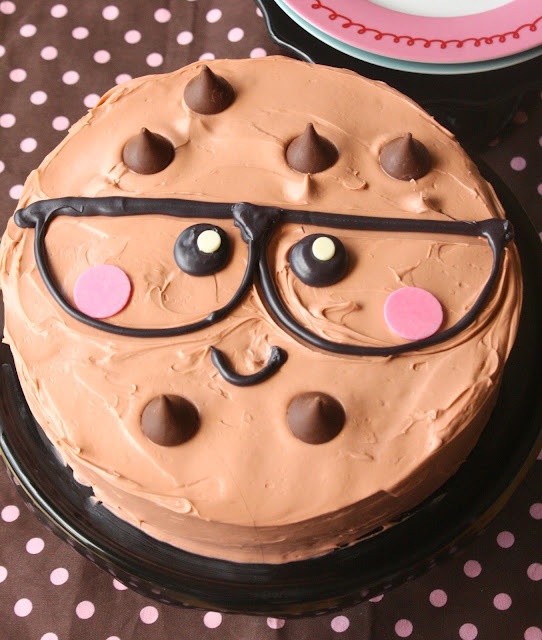 ), but I have not seen a One Smart Cookie cake, and thought it would make a fun treat for the end of the school year, or even boxed up for a teacher gift.! I almost made a pizza-size cookie, but I will save that for next time. I ended up using four different food gel colors (a drop at a time: Americolor warm brown, chocolate brown and Wilton ivory, and brown) until I achieved the color I wanted. After I frosted the cake and added the Hershey's kisses, I used a small, offset spatula to imprint the general placement for the eyeglasses (above). I added the glasses by putting the melted, black candy melts in a decorating bag, fitted with a #10 tip and applied it directly on the cake. I also used the same tip for the mouth. I am sure black (non-melted) candy melts would also work for the eyes, or Junior mints. Of course, royal icing could provide all the facial details, if you prefer. 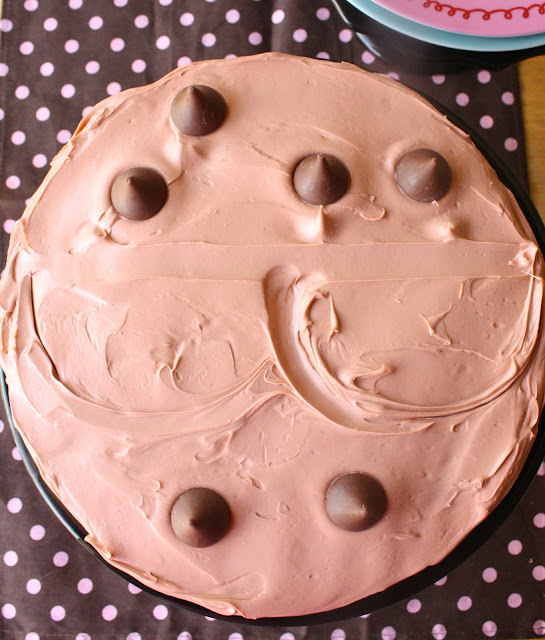 This cake was easy-peasy to make and turned out pretty darn cute! It would definitely be a fun cake to make with your own munchkins and little scholars! I love this too cute cake! Looks like YOU are the "smart cookie"! ..and that plate, I love it! So adorable! I would love to have a bite too! Lisa, I already know you are a creative genius! 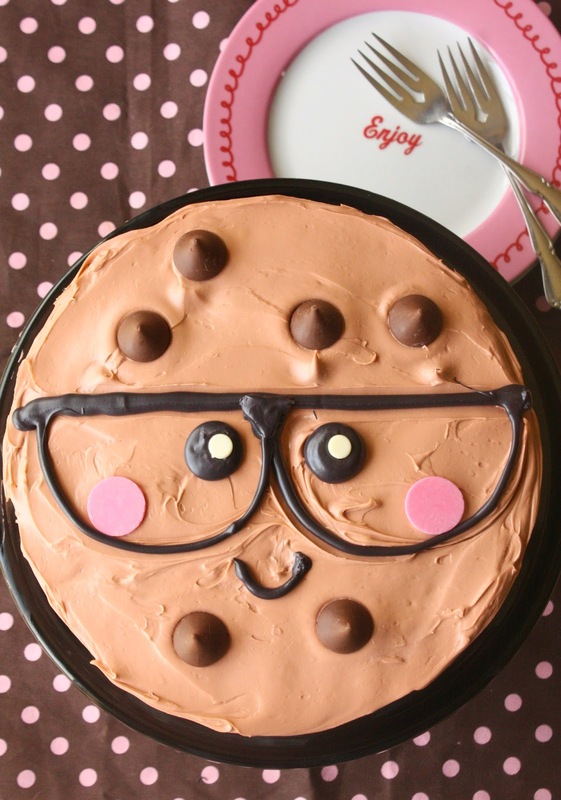 That is such a cute cake! That would be fun to give to kids when they have to get glasses too! Celebrate it! Such a fun, whimsical cake. 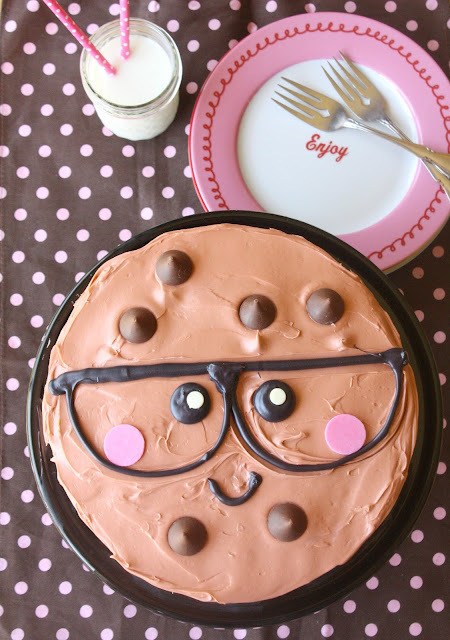 I remember your One Smart Cookie cookies and love them - this cake is adorable too! I'm sort of in love with this cake! We travel to see family over the summer, and I bake a ton. This is definitely going to get made, and I know my kids and nephews and nieces will go absolutely bonkers over it! Love it so much! Awww, thanks so much Aida! Have fun! Adorable. Just adorable. I think I can make this!